It’s no secret that proper planning yields greater results. 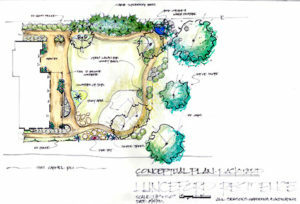 You wouldn’t build your home without a design, why should your landscape be any different? Create a harmonious theme to build on, to avoid costly mistakes! Call 805-544-5296 or send us a quick Design Contact Form to reach our Design Department. 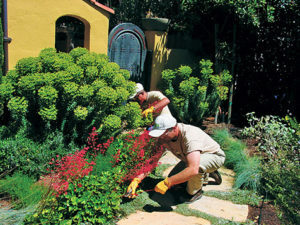 Fertilize actively growing plants such as roses, lawns, annual flowers, vegetables, and container plants. Treat Iron Deficiencies with chelated iron and/or soil acidifiers (found at most nurseries or home improvement stores). Most soil on the central coast tends to be on the alkaline side of the pH scale (over pH 7). With a pH over 7.5, iron and some other minerals become insoluble and plants are unable to absorb them. Application of a soil acidifier will bring these minerals back into a soluble state so they can be utilized by the plant. Lack of iron causes leaves to lose their green color (decreased chlorophyll production), starting at the outer edge and progressing inward (a condition called chlorosis). Leaf veins usually remain green and the newest leaves are the most affected. Gardenias, citrus, and azaleas are examples of plants that commonly exhibit iron deficiency. Now is the time to sow seeds of beans, corn, cucumber, New Zealand spinach, okra, pumpkins, and summer and winter squash. Set out transplants of cucumbers, eggplant, melons, peppers, and tomatoes. Plant herb starts such as lemon balm, mints, dill, cilantro, thyme and many more during this season. It is also a good time to plant subtropicals such as bougainvillea, trumpet vine (Distictis), banana, philodendron, bird of paradise, and hibiscus.